Plunging into the world of Case brand knives is akin to what Alice encountered when she fell down that rabbit hole. It is a bewildering place and you could get caught up in a mad tea party if you are not careful. I have wandered around there for some time, in the guise of doing research. I will try to interpret what I have found in a way that, hopefully, will make sense to someone who wants to understand the world of Case to efficiently sort through their extensive knife line. Understanding the Case knife line is difficult, because it contains so many individual knives. As of February 2015, the company lists some 400 separate knives in its current catalogs. This total is about equally split between knives listed in the Case 2014-15 Core Catalog and the Spring 2015 Seasonal Catalog. My understanding is that the core catalog knives are those that are produced and maintained in inventory on an ongoing basis, while the seasonal catalog lists those which are produced in intermittent, small volume runs. The current catalogs may be accessed on and downloaded from the Case website. When I began thinking about writing this article, I decided right away that I wanted to focus on pocket knives. This is because Case is primarily a pocket knife company. I knew this in general terms, but here is the documentation: fixed blade knives and folders too large for normal pocket carry account for about 80 of the roughly 400 Case knives. By "folders too large for normal pocket carry," I mean knives in the neighborhood of five inches closed length, which I consider too large to reasonably be classified as pocket knives. If one is shopping for a Case knife that fits these parameters, the task is not daunting, so I will not say any more about fixed blade and large folding knives. This leaves some 320 current production pocket knives to sort through. Is there a way to find a desired knife among these without an inordinate amount of catalog browsing, internet searching or window shopping? Bear with me and I will try to give you some insights that may help you categorize and sort Case pocket knives. The place to start is with factory patterns. A factory pattern specifies the parts and dimensions for the metal components needed to build a knife of a given type and size. This includes liners and cut centers, springs, bolsters, pins and blades. A listing on the Case website indicates they currently use 74 pocket knife factory patterns; i.e., they are routinely or intermittently producing knives on these patterns. Case may base multiple knife patterns and specific knife models on a given factory pattern. For instance, factory pattern #18 is for a 3-blade medium stockman knife with a 3-5/8 inch finished closed length. Two knife patterns and three models built on #18 are pattern 5318 Model 179, pattern 6318 Model 042 and pattern 6318 Model 039. How are these different? The first two are identical except for the handle material. Model 179 has natural stag horn handle scales, while model 042 has jigged, amber dyed bone scales. The only difference between models 042 and 039 is that the first has stainless steel blades and the second carbon steel blades. The key thing to understand is this: Differences in handle material, blade steel, or blade pattern in knives built on a given factory pattern yield different knife models. Further, not just the type of handle material, but its color and the way it is finished also defines different models. For instance, if the only difference between two knives is that one has a red jigged bone handle and the other a red smooth bone handle, then they are different models. To summarize, at any given time Case might be producing one, a handful, or double digit numbers of specific knife models from a particular factory pattern. Finally, be aware that there may be multiple factory patterns to build the same type of knife. Recall the #18 stockman pattern, which yields a knife 3-5/8 inches long. There are five other factory patterns for stockman knives of different closed length. Further, pattern #18 has a virtual twin in pattern #32. Both produce finished knives 3-5/8 inches long, but pattern #18 has round handle bolsters and pattern #32 sports squared bolsters. Be alert for subtle differences like this. There is very little difference in the metal parts specified in the various pocket knife factory patterns. Virtually all include brass liners and cut centers, brass or steel pins, nickel silver bolsters and spring steel back springs. The only significant variations within a factory pattern will be in blade steel (either stainless or carbon steel) and perhaps the specific pattern of one or more blades. Case uses Tru-Sharp stainless steel for blades in the majority of its pocket knives. However, a significant number of knife patterns may also be had in Chrome Vanadium, a high-carbon tool steel. These two steels are commonly coded as SS and CV, respectively, in product descriptions. I will not get into how good, bad, or indifferent these steels are. I will say that I own or have owned knives in both and I have never been disappointed with the performance of either. Twenty-seven blade patterns are listed and illustrated on the Case website. The Clip and Pen patterns are by far, the most used in Case pocket knives. Case even uses three variations of the clip pattern. Handle scale material and finish is the most complicated variable in Case knives. Case key codes 14 different handle materials, individually or in groups. Broadly, these include cattle bone, solid and laminated wood, a variety of synthetics, stag horn, shell (such as mother-of-pearl and abalone), ivory and other exotic materials; a few models use stainless steel or aluminum. The most common handle material key code is 6. This is a group of materials including smooth or jigged bone in various colors, jigged synthetic materials in various colors and jigged laminated hardwood. Within this group, bone is the most common material. Case uses only shin bone from Brazilian Zebu cattle, which can be dyed in any desired color and is usually, but not always, jigged. Case has an arsenal of 20 jigging patterns, although only a handful of them are used frequently. Here is an example that may help pull all of this together. About three years ago I bought a Case medium stockman to replace a similar knife I had worn out. The knife pattern is 6318 SS and the model number is 042. The 6 in the knife pattern number denotes handle material key code 6; the 3 is the number of blades and 18 means that the knife is built on the #18 factory pattern. SS means that the blades are stainless steel. Finally, Model 042 identifies this knife, uniquely, as having all of the features implied by the knife pattern number, plus it has clip, sheepsfoot and spey blades with jigged amber bone handle scales. Here is a mini review of this knife. Case Medium Stockman #6318 SS 042. Image courtesy of wrcase.com. Blade pattern/length: Clip 2-1/2 in., Sheepsfoot 1-3/4in., Spey 1-5/8 in. This knife is about as classic as a slip joint folder gets. The stockman frame pattern, size of the knife, blade patterns and jigged and dyed bone handle scales are all traditional. The only thing that would make it more so would be carbon steel blades. I had my reasons for getting the knife in stainless, but it is also available in CV carbon steel. This is one of my working knives. It is the knife I most often drop into my pocket when I am getting ready to do chores around the house, yard, or am heading out to the shooting range. In three years of use, the only sign of wear is some light scuffing on the bolsters, which is to be expected. I have touched-up the cutting edges of the blades a few times to keep them factory sharp or better. The steel is easy to sharpen. However, one must understand this is not a heavy duty knife. In particular, the slender California clip pattern main blade should not be forced through heavy cuts. It is simply not designed for heavy work. I consider this a medium duty pocket knife. I love the aesthetics of this knife. Its classic stockman design and light to dark amber scale color look good. Also, the irregular jigging pattern, called peach seed, is my favorite of the Case patterns. 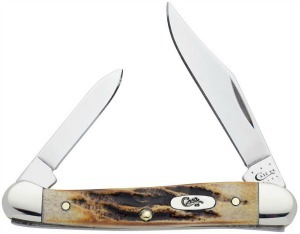 This may be the most popular Case knife pattern. A search of the Case website returned 39 knives currently offered in #6318, which is a huge number of specific models based on a single pattern. Hopefully, the background I provided above should help you browse the Case knife line, or search for a specific type of knife, without becoming hopelessly confused. Here are some additional relevant tips. The place to start browsing or searching Case knives is the company website, www.wrcase.com. There are nine topics listed across the top of the home page and clicking on any of these will take you deeper into the website. To browse knives or access catalogs, begin by clicking on the first topic, Knives. This yields a new screen that has a box labeled Browse Knives on the right. There are over a dozen options listed in that box, but to get an idea of how to best browse Case knives, click on the option titled 2014 Core Product Guide. This will open a PDF file that features the current core product offerings. You may browse the PDF file directly, or download it for future reference. If you download the core catalog, you are probably interested enough to want to download the latest seasonal catalog, too. Knife images and descriptions start on page four of the current core catalog. The first group of knives is the Genuine Stag family, which includes 14 individual knives that have stag horn handle scales. This is how Case organizes their offerings; i.e., each family contains knives that have a particular handle material and treatment in common. This knife family organization is used in the core and seasonal catalogs, as well as on the website. Each knife family presentation, whether in the PDF catalog or directly on the website, will contain images of the knives in the family and spec information for each. You can browse all you want by scrolling through the catalog or clicking the knife families on the website. The spec information is more complete in the catalog, though, so I prefer to browse there. Suppose we look through the genuine stag family and a particular knife gets our attention, for instance the Mini Copperhead. In the catalog, this knife is coded as 519 (52109X SS). 519 is the unique model number of this knife, while the knife pattern code, in parentheses, translates as follows: 5 denotes the handle material is genuine stag horn, 2 means that the knife has two blades, 109 is the factory pattern, X denotes that the main blade is a clip pattern and SS means the blades are stainless steel. The catalog specs this knife as having clip and pen blades, a closed length of 3-1/8 inches and weighs 1.4 ounces. Case Mini Copperhead Model 519 with stag handle. Image courtesy of wrcase.com. Suppose we become intrigued with this knife pattern and would like to know if there are other mini copperhead knives available. We could scroll through the catalogs, looking for other mini copperheads, but that would be inefficient. Instead, go back to the website and use the knife search feature that can be found on almost every website page. The search feature works off of keywords. If I type "mini copperhead" in the keyword box, the search returns several pages of specific knives. However, only the first ten of these are mini copperheads, while the remainder are other knife models that have the word "mini" in their names. I found what I was looking for, but this example illustrates that the keyword search engine works on a both/either word basis when I use two word search terms. Similarly, if you use a single keyword, e.g., "trapper," the search will return every knife that has that word in its pattern name. You have been warned. There are many other neat things on the Case website, but I will not get into them here. Browse around if you are curious. Nowadays, I mostly purchase knives and related items on line. The better internet vendors offer extensive product lines, very competitive discounted prices and good customer service. Major internet vendors are generally discounting Case knives by about one-third of MSRP. It has been some time since I have had a bad experience dealing with a well-established internet vendor. Vendors that are heavily into Case knives and with which I have experience include Case Knife Outlet (caseknifeoutlet.com), the Knife Center (knifecenter.com), Shepherd Hills Cutlery (casexx.com) and Smoky Mountain Knife Works (smkw.com). 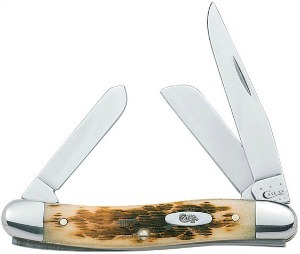 These vendors list large numbers of Case knife models. In fact, they may have models that do not appear in the current Case catalogs. These are usually past seasonal runs that have not sold out. Alternatively, currently produced knives can be bought online directly from the Case/Zippo store. If you want to see some Case knives before you buy, there are probably a few licensed retailers in your area. There is a dealer search feature on the Case website that can be used to locate these. Be aware that discounts through the company on-line store or at licensed retailers will usually be less than those offered by the major internet vendors. However, if you visit a local dealer and take advantage of their time and service to examine a knife, it is only fair to purchase it there. Case has been making knives for over a century. They have established and maintained their brand name and reputation largely on the basis of their pocket knives. I expect they will be around for as long as they continue to offer a variety of quality knives at reasonable prices. Copyright 2015, 2016 by Gary Zinn and/or chuckhawks.com. All rights reserved.